We wait…..holding our breath as to the future of America’s Mustangs and Burros, both on and off the range. We wait…..while knowing a temporary reprieve has been negotiated, slight though it may be, that BLM will not yet act to destroy or openly sell our wild horses and burros for slaughter. We wait…..for a report from the Government Accountability Office (GAO) on BLMs management of the National Wild Horse and Burro Program that will, in some measure, decide the fate of our herds and their homes. And we wait….for what Congress will choose to do, how they will respond and what solutions they will allow for their continued preservation. As the lives of America’s wild horses and burros hang in the balance, this temporary truce has been made possible because of the efforts of the Honorable Congressional Representative Nick J. Rahall, II, Chairman of the Committee on Natural Resources and the Honorable Congressional Representative Raul M. Grijalva, Chairman of the Subcommittee on National Parks, Forests and Public Lands. It was they who had the foresight to order a review of BLMs management of the Wild Horse and Burro Program over a year ago. It was they who stood up and spoke out immediately about BLMs recommendations to kill our wild horses by hook or bullet, a.k.a, Instant Titling or Euthanasia. These two honorable men have given the gift of life to our wild horses and burros, at least for today. Then perhaps consider taking another moment out, in a time where moments have become luxuries, to appreciate and send a note of thanks for the efforts of all those who have rallied behind the scenes on this long road against what seems to be overwhelming odds, who would not forget, who would not allow Americas Mustangs and Burros to be quietly eradicated, who have sacrificed and given so much of their time, their money, their homes and their hearts towards the protection and preservation of our heritage species. And maybe consider extending your moment of gratitude even a little further by remembering and appreciating those ranchers who were not motivated solely by greed, who have helped wild horses and burros by keeping land free from development, keeping the water on, gates open, fences down, or trying to help the sick and injured when they needed it. 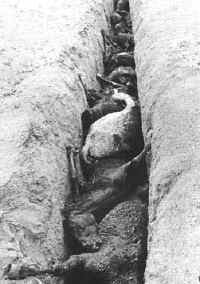 Remember all those in wildlife preservation that reseeded public lands after fires have scorched the Earth, which helped feed wild horses and burros, fought to keep habitats from being further fragmented, added water sources to help all species and cared more about the land and the animals than the revenue they could generate. And finally, remember to appreciate all those in the government agencies themselves who began with a desire to work with public lands to preserve and protect our resources, who honestly believed in their roles as public stewards, who fought their own internal agency battles for integrity and honesty against political and financial pressures, who tried to make positive contributions in whatever ways they could and who often times were not rewarded in the slightest for their efforts. Today, let us be grateful that our cup is half full. It’s the New York Times, one of the “top” news sources in the country or so I’ve been told. I have never read the NYT much, my exposure to their journalistic excellence limited to jokes about it as a news source from Stephen Colbert of the Colbert Report. Yet for the first time ever, I have found myself agreeing with FOX News…..This is fair and balanced media? I guess nothing is what is use to be as official news sources sound more like blogs and people like me are having to create blogs just to try and pick up their slack. Let me also say, at least I distinguish the difference between my opinion and the facts or at least try to present the facts that justify and form my opinions. 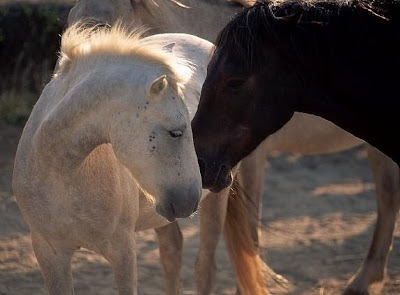 Today the New York Times published an article titled, “On Mustang Range, a Battle on Thinning the Herd”, which finds writer Felicity Barringer making some astonishing statements. I would be very interested in knowing how she, in good conscience as a journalist, found actual support for much of what she penned or why the editors of the NYT found this an appropriate forum for her opinions. Really? What facts or polls is this taken from? Could it be Mr. William’s own opinion Ms. Barringers used as substantiating evidence for this odd statement? I’ve heard his ego is large enough to shoulder his opinion of his own opinions. What I haven't heard is a single wild horse and burro advocate that was “more outraged” by Ted's opinions than they were by BLMs recent declaration of wanting authority to kill or sell America’s wild horses and burros for slaughter and I have talked to more than a few since BLM made this announcement. In my opinion, which is backed by reams of well-documented supportive statistics, BLM unsubstantiated “need” is nothing more than a public declaration that their malfeasance cloaked as management merely desires to cleanse the American scene of the presence of mustangs and burros to make way for more lucrative industries. While we find the NYT article provided links for those quoted about the “mustang problem” such as Ted Williams, the Bureau of Land Management, Nathaniel Messer of former BLM service in BLMs highly "selective" National Wild Horse & Burro Advisory Board, Steven L. Davis of Oregon State University and even the Earth Liberation Front, which I’m still scratching my head about as to the actual relevance this obscure reference was intended to serve, the NYT obviously felt no such links were necessary for any source that challenged these one-sided claims. As for the BLM officials quoted, I couldn’t help but chuckle at Ms. Barringer’s uncanny ability to find some of BLMs prized authorities on the subject of mustangs and burros. First, there is Arlan Hiner from BLMs Winnemucca Office, the guy who knew the Jackson Mountain wild horses were standing in empty troughs with no water for at least two months before issuing the helicopter driving decision where 185 wild horses eventually died due to “nothing related” to BLMs involvement (to hear BLM tell the story) or who recently developed and authorized a grazing plan in Soldier Meadows to put up more fences for more cattle that BLM admitted could potentially entrap the wild horses and cause them to die in the winter snows. Then there was Alan Shepherd, reported by the NYT as the guy “who helps run the contraceptive program”. This statement is beyond laughable as Jay Kirkpatrick, also quoted in the NYT article, is actually considered the Father of the fertility control program now being used on mustangs, and that's Dr. Jay Kirkpatrick NYT, the real guy “who helps run the contraceptive program” - with wheel barrels full of overwhelming scientific accreditation and citations to back up this well-documented fact – but proves to be something the NYT completely fails to notice. Even more incredulous is the fact that the New York Times actually published an article about Dr. Kirkpatricks presentation to the Human Society of the United States all the way back in 1988 about how PZP, the fertility control drug now being used on many of our mustangs, was being developed - apparently Ms. Barringer doesn't read the NYT either. While NYT is granting Alan Shepherd the credit for helping run the contraceptive program, they dubiously omit the fact that Alan Shepherd is actually a mid-level BLM employee with the current title of Wyoming’s Wild Horse & Burro Lead. Mr. Shepherd is the same guy that told the Casper Star-Tribune back in 2005 regarding wild horse reproduction that “a 40% increase in a year is not unusual”. Yet the U.S. Geological Survey recently released a Report (1), which had to "...combine births and deaths, which is necessary because no data on these separate processes are available." In other words, BLM had no records of separate wild horse reproduction or mortality rates regarding Wyoming’s two largest wild horse herds, despite almost forty years of management. Since Alan Shepherd is now being touted as "the guy" in the contraceptive program, it goes a long way towards explaining BLMs management and how America's mustangs and burros have now found themselves poised to receive a bullet to the brain since BLM became their stewards. This article was dismally disappointing and is filled with so many gross distortions and misleading statements that there just isn't room to address them all! While others may continue to cite the New York Times as a credible news source - and maybe that use to be the case - from what I’ve seen of their journalistic “integrity” through this article, I’m personally going to just chalk them off as nothing more than a glorified blog. But that’s just my opinion…..
On June 30th, 2008, the Bureau of Land Management (BLM) announced the Wild Horse and Burro Program had reached a crisis point of epic proportions. As a result of removing over 75,000 wild horses and burros from public lands since 2001, BLM now claims the cost of holding 32,000 warehoused animals has exceeded the programs financial limits and something must be done. *Allow BLM to grant Instant Title to adopters, almost a guaranteed slaughterhouse end. *Allow BLM to shoot tens of thousands of wild horses both on and off the range. *Give BLM more money to manage the Wild Horse and Burro Program. While BLM is attempting to focus the public’s attention on “what” should be done about BLMs reported crisis of “excess” wild horses and burros, the first question the public should really be asking is, does BLMs data back up their claims? Despite the massive cleansing campaign over the last several years, BLM continues to report 33,000 wild horses and burros still roam public lands. However, independent analysis utilizing BLMs own statistics and methods of annual population reports, removals and reproductive rates concluded the most likely wild populations still remaining is merely 13,500 wild horses and burros - 20,000 less than BLM reported. BLMs own data fails to support their population claims by a large margin and evidence strongly suggests the agency has removed 11,000-14,000 more wild horses and burros than was necessary. In other words, BLMs own statistics point to the conclusion that the current “crisis” has been manufactured. American Herds offers this timely report, “Americas Mustangs & Burros: What’s Left, The High Costs of Miscalculating and Will They Survive?”, a culmination of two years of research into a variety of BLM proposals, policies and management, both in the wild horse and burro program as well as other multiple uses of public lands. This comprehensive overview provides a wide variety of case studies, documents, statistics and data, most taken from BLMs own reports, as well as a brief history of the abuse and malfeasance over the years in the wild horse and burro program, some alleged, some proven, and where it stands today. Several versions have been created for easy access, portability and to send as attachments for anyone who wants to learn more about what has really been happening to Americas Mustangs and Burros. While BLM maintains options are limited, now narrowed to merely choosing which way the American public wants to see wild horses and burros die unless BLM is given more money, another option exists, though it is hardly one BLM will recommend, and that is to examine the validity of BLMs claims and investigate their management. Research and analysis based on BLMs own statistics has shown their current population reports or population goals cannot be valid. As a result, the simplest solution to the current “crisis” is to return the wild horses and burros back to the range, as statistics reveal they should have never been captured and warehoused in the first place. To learn more, click the links below and wait for them to download as some files are quite large. Giving it a "test run" found some gliches in the links but they were ususally fixed by clicking back and then retrying. Will continue working to fix. Part III ~ Will They Survive? Well, as expected, it would appear BLM has decided it’s now a free for all in the Wild Horse and Burro Program and destroying the herds as fast as they can is at the top of their agenda. In a sad parallel to other atrocities committed by corrupted zealots, I’m reminded of the killing frenzies conducted by the Nazi’s when they realized their “kingdom” was about to fall. 1. BLM approve a Herd Management Plan for the Nevada Wild Horse Range wild horses, the first and oldest of America’s protected herds, a plan that includes a little one liner about the “option” to completely wipe out the herd and replace them with 100% geldings. 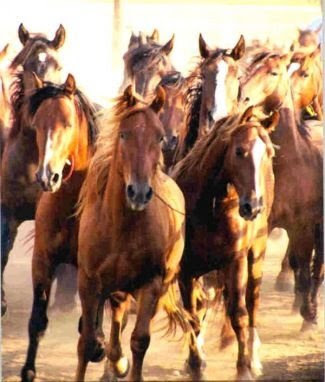 Imagine….BLM has granted themselves the “authority” and option to now ship geldings into a restricted military base where no prying public eyes can go. 2. The option to castrate stallions right in the field at the round up pens and then release them back into the wild 24-48 hours after surgery, all the while maintaining BLM will monitor all geldings for 7-10 days. Sure they will....and if they bleed to death, who will know? 3. Unsatisfied with “selling” America’s heritage species, BLM now wants the authority to shoot them straight on the range for any reason in a tidy little package called euthanasia. And they also want to do it FAST, especially with 1,000 wild horses currently being gathered at the Nevada Wild Horse Range at this very moment (aka, Nellis Air Force Base). According to wild horse advocate, Karen Mayfield, who attended Mondays National Wild Horse and Burro Advisory Board meeting, the Advisory Board has appointed a three member panel that is suppose to “discuss” euthanasia via conference call within 10 days of last Monday’s meeting. Apparently, for the first time in their bureacratice history, they have a fire under thier butts to "do something" about BLMs mess, which they have supported and encouraged every step of the way. *Board Recommended to implement to review their census. *Recommend radio tracking research in Sheldon range. *Recommend for BLM to come up with 3 HMA's for the gelding issue. *Cost analysis for spaying mares. *Recommend for BLM to act in a timely manner to present Herd Management manual. *Recommend euthanasia. They have delegated a subcommittee of three of the advisory board members to have a conference call within the next 10 days to discuss euthanasia. *They also discussed Instant Titling for the Long-Term Holding Facilities, which would take act of Congress. Do these three members have the authority to issue a “kill” decision or does it have to come from the Secretary of the Interior? Apparently BLM believes they do NOT have to get permission from Congress to begin shooting wild horses at the round pens, only at the long-term holding facilities. Does BLM intend, based on the “three member recommendations”, to begin to immediately start euthanizing wild horses, perhaps at Nellis or some of the other “emergency round ups” planned in the next few weeks? Euthanizing wild horses and burros is already legal – it was built into the Wild Free-Roaming Horse and Burro Act but Congress has previously forbid it. However, the Secretary of the Interior has been given “broad powers” to manage the Wild Horse & Burro Program as he sees fit and since it is already legal, in my opinion, he DOES have the authority to exercise this option. And what’s Congress or a judge going to do about it since it’s already an established law? Is BLMs newest plan to just shrug their shoulders later IF Congress “slaps their hand” and then issue an insincere apology of “Our bad….” over the bodies of the now dead wild horses?